Hearts manager Craig Levein has told Brendan Rodgers he can “bleat all he wants” but the Tynecastle pitch will be in the same condition the next time Celtic visit. Rodgers claimed he was “embarrassed” by the pitch after his team’s 3-1 victory over Hearts on Sunday, as he revealed the length of the grass had forced him to ditch his normal tactic of building from the back and playing more direct instead. 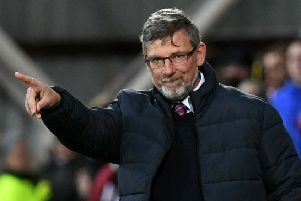 But Levein has hit back at the Celtic manager and argued he was well within his rights to keep the grass slightly longer than usual against the big-spending Ladbrokes Premiership champions. “I sat with Brendan for 20 minutes after the game and he never mentioned it,” Levein said. “I would have hated to see the fury and the froth if they had actually lost the game. “If we want to talk about a level playing field, if they bring a team through here that earn the same money as our players do, then we will put them out on the pitch and see who wins. “There is not a level playing field in Scotland and I make no apologies for staying within the rules and trying to win the game. None at all. Levein added: “I just get disappointed that Brendan can set his team up and his pitch up any way he wants. Hearts have committed almost £1 million to laying a new hybrid pitch in the close season but Levein warned Rodgers not to expect the grass to be any different on his next visit. “We’ll just let it grow,” he said. Levein also confirmed Hearts would challenge any potential ban for Steven Naismith after it emerged that Scottish FA compliance officer Tony McGlennan was considering action over the forward’s tackle on Celtic skipper Scott Brown.